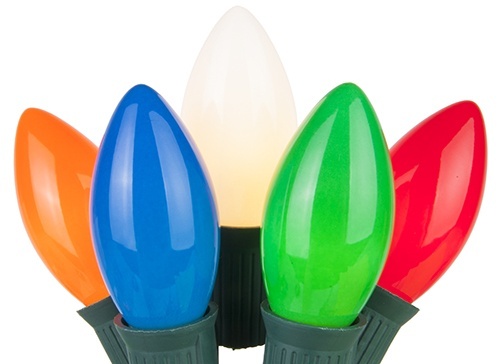 Festive & Fun: Multicolor Lights are The Life of The Party! 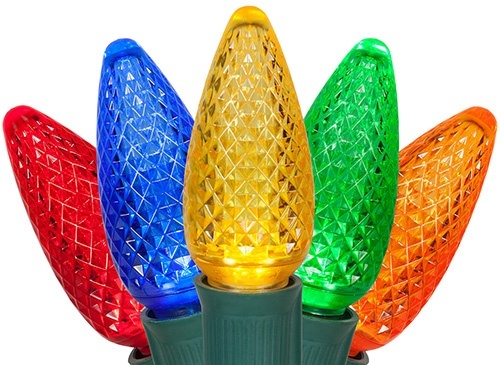 Multicolor Christmas lights represent a very unique color theme for the holidays because they don't have traditional Christmas color roots. Multicolor lights also have a unique cultural history because they got their start in America more so than Europe. Multicolor lights inspire a playful color palette and an energetic tone. They bring a sense of joy, creativity, youthfulness, and liveliness that other Christmas light color combinations do not. If you like Christmas decorating and you dare to be different, adding more color to your home may be the thing for you. How did multicolor lights even become a thing? During the 18th century, people would use colorful candles to decorate their Christmas trees, but this was a far cry away from the colored lights we see today. In 1882, Thomas Edison had 80 red, white, and blue Christmas bulbs made for himself and then hung them on his Christmas tree near a window. People at the time were still uneasy about electric lights on their trees and continued to use candles until President Grover Cleveland lit his tree with over 100 multi colored bulbs. This sparked America's multicolor attention. 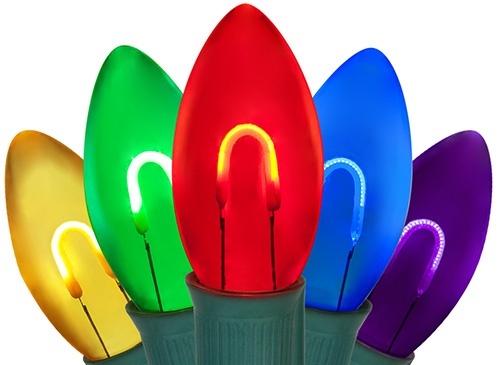 As time went on, new multicolor light products were made and as they became more affordable, the multicolor light phenomenon took hold across the U.S.
Multicolor lights may be associated with Christmas first, but they also live a life far beyond Christmas because they are often used year round. It's common to see them being used in restaurants, stores, festivals and more throughout the year. Notably, even Halloween sees decorating with multicolor lights mixed with purple or orange to create more of a spooky carnival atmosphere. 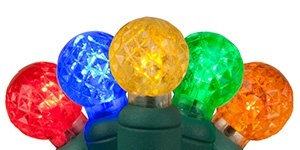 Outside of big events, multicolor lights can be pretty common in birthday parties, school events, home decor, and decorating a patio, deck, or balcony. When people want to make an area a little more festive, multicolor Christmas lights do it instantly. Not sure about whether to get LED or incandescent bulbs? The main factors in deciding are usually preference, price, and display size. LEDs are the better option for a large display because they will save you on power, setup is easier with less extension cords needed and they're more reliable overall. However, LED lights are also more expensive. If you are on a budget, incandescent lights can do the job, but they require more planning and depending on the display size, they may require you to think more about how many outlets and circuits you need available to power the display without tripping breakers. There are many bulbs. So many, it can be overwhelming. 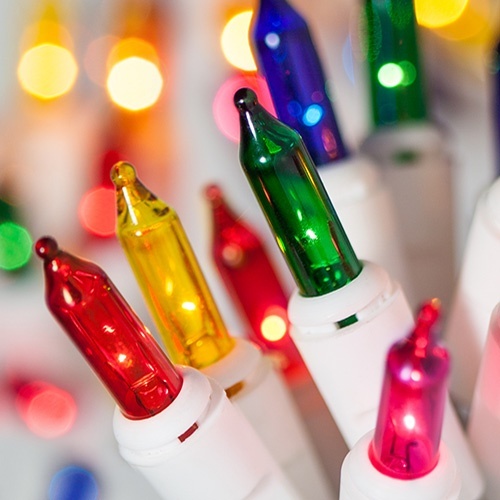 Determining which multicolor lights are best for you is depends on what you like and what's best for the setting you're planning to decorate. Here's a basic multicolor lights 101 guide to get you started. 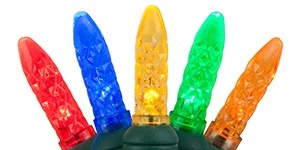 Incandescent mini lights are typically fine as the best option for those on a tight budget. However, if you want to make the move to LED, there are a few versions of LED mini lights that look like traditional Christmas mini lights: the M5 and the T5. Both have the same shape, but M5s are typically diamond faceted whereas T5s are smooth. If you want your tree or greenery to look as traditional as possible, go for the T5. If you want your lights to look a little more exquisite, the faceted M5 is your choice. Some people want larger lights inside. If that sounds like you then consider multicolor G12 raspberry lights or C6 strawberry lights. They look amazing and provide a different feel that gets away from the traditional mini light shape, while still retaining their Christmas spirit. While incandescent lights both large and small can be used outside, they are increasingly less preferred because they require more planning, use more electricity and are less reliable than LEDs. However, they maintain their unique incandescent look and for some people, that's exactly what they want. 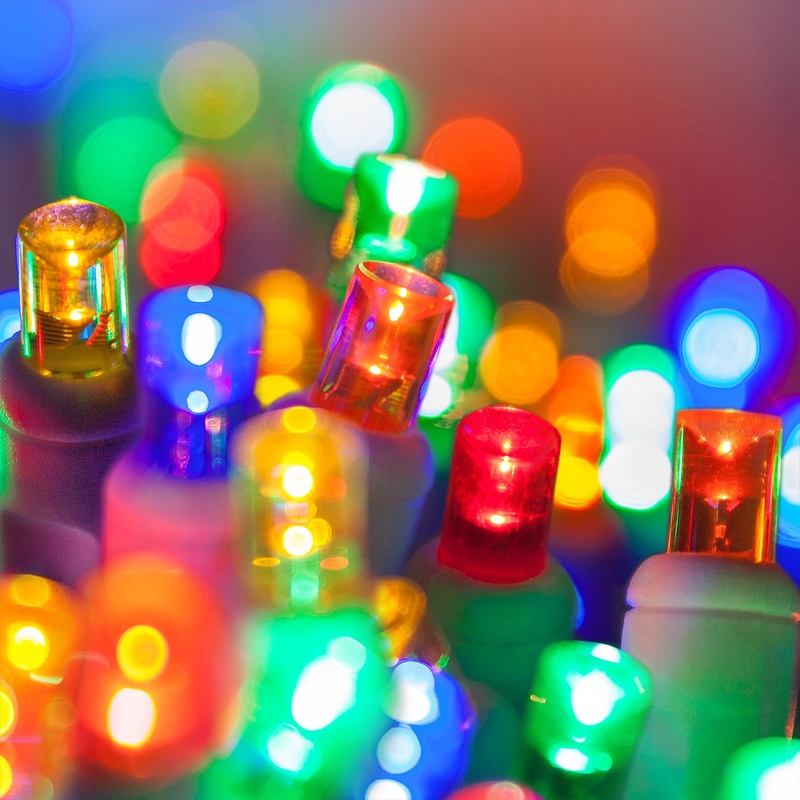 Most incandescent lights come in a transparent finish, opaque finish, or sometimes a satin finish. Each version creates different color optics. If you're looking for maximum color, go opaque. If you want more subtlety, consider transparent or satin finishes. For LED multicolor lights, you have the same options listed above, but you also have extra bulb finishes like the very popular faceted bulbs. For displays like tree wraps, bush wraps, wrapping columns or railings, any multicolor LED string lights will work, but the 5MM wide angle bulbs are a top choice because they are small, easy to work with and look great. They are also highly durable. For larger C7 or C9 bulbs, you can now get LED bulbs that look incandescent, like LED FlexFilament™ bulbs which are increasingly popular. 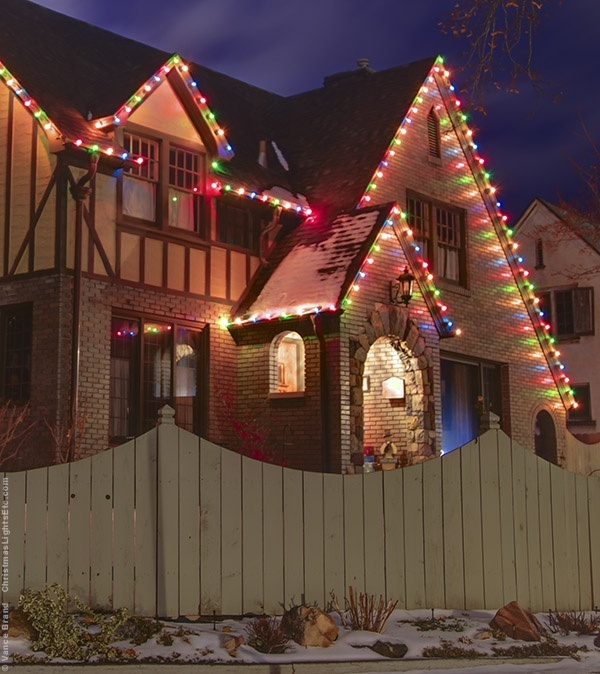 For wrapping larger trees and outlining driveways, paths or rooflines, C7 and C9 LED bulbs can be strung in very long lengths, which often makes power planning much easier. Accenting with Multicolor: For just a hint of color, line your roof with cool white or warm white lights. You can then pick a few trees or bushes and use these as your yard's color accents by wrapping them with colorful lights for just a touch of fun! Moderate Multicolor: If you love multicolor lights, but want to use them in moderation, consider this approach. By lining your roof ridgelines or gutters with multicolor lights, the strict pattern of the lines will provide a clean look while still being fun. Driveways, pathways and other landscaping borders are great to showcase color, and because they typically follow patterns, it's a safe way to introduce multicolor lights without going full tilt. Maximum Multicolor: You could just throw multicolor lights everywhere, smile and be done. But if you want to go this route consider following a few of the design techniques that pros use to keep your display from looking too chaotic. Avoid using mini string lights for everything in your yard. Between trees, bushes, railings and other outlines, it can begin to look more like chaos than colorful fun. 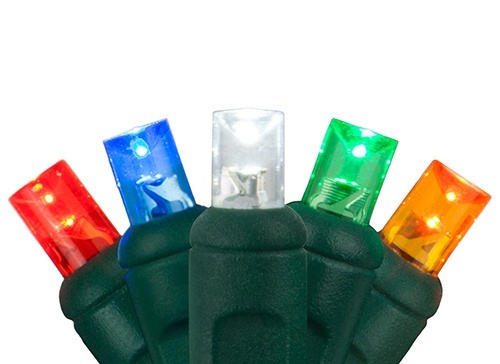 For bushes, consider using multicolor net lights, which can provide a diamond pattern. Similarly for trees, you can wrap them in either net lights or trunk wrap lights or use string lights wrapped in a candy cane swirl pattern...again, giving your decor areas multicolor touches, but with distinct patterns. For larger tree wraps where you want to light your canopy, consider doing a controlled swirl around the canopy rather than throwing the lights haphazardly through the branches. Your tree will look better and it minimizes the chaos. Rooflines near gutters are a great place to try combo lighting with different light types. For example, you can line the gutter with C7 or C9 bulbs, but then beneath the gutter you can hang multi-color icicle lights. This creates two different lighting textures in the same area while maintaining your color theme.